Kothimora series are very special kukris and very old tradition to decorate the scabbard using pure silver filigree with top quality velvet as background. Beautiful patterns are carved in the scabbard depiciting cultural and traditional values using domestic tools. These kukris are used for ceremonies and as gifts to mark respect and appreciation. In the army, a higher rank officer will be presented one before leaving the regiment. A Nepali bridegroom can also be seen wearing one with his ceremonial wedding costume. 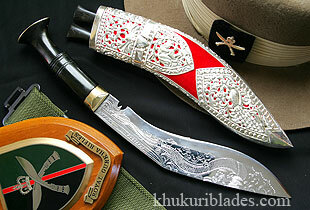 These Kothimoras are of differnt colour velvets, different sizes form 4 inches blade to 11 inches and of different prices depending on the regiment's color flags and on the amount of silver used. Case exclusively designed using pure silver filigree with top quality velvet. Used for ceremonies and given to retiring officer.